Top medical surgeons at the National Referral Hospital (NRH) have warned of a real danger posed by consuming kwaso (home-brew) following four deaths over the past one and half month of this year . Speaking to the Solomon Star in an interview Dr Rooney Jagilly, NRH’s Medical Superintendent and Head of the Surgery of Department confirmed the deaths related to kwaso complication. “Yes, we have recorded few deaths as a result of kwaso consumption over the past month and weeks. He said, interestingly, compared to last year, within one and half months of this year five cases have been recorded. He said, these patients have some kwaso consumption as well as history of gastric ulcer inside their stomach. 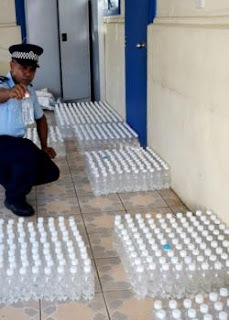 Most of the cases are from Honiara. A General Surgeon at the hospital Dr Scott Siota said, the number of people being admitted at the hospital related to kwaso complication is rather alarming. He explained this is because of the four deaths as a result of serious complication. Dr Scott, who operated on the patients said, the youngest was, 20, while the eldest, 58. Most of them were married and have families. He said, some died soon after being admitted without undergoing any operations. Others died later after undergoing operations. “Only one survived after undergoing surgery,” he added. Dr Scott warned the numbers are likely to increase if people who love to consume this high alcohol content product do not take heed of their advice. He cautioned, those who have stomach ulcers are at risk. So, he added, if people who suffers from this ulcer disease consume kwaso and alcohol they are at risk. Dr Rooney further advised, the message is for the public to know the dangers of kwaso and how it affects economy and families. He said, its important for everyone to work closely with the police in curbing the problem starting production, sales and consumption of kwaso. He pointed out how it costs the hospital a lot of time and resources to try and save these patients. “Not only that but it costs the families for loosing their loved ones. “So people should be aware that there is a real danger in consuming kwaso and we must all work cooperatively to fight this trend from the producers, sellers, and consumers,” he warned last night. Dr Rooney said, they hope to see less numbers if people take-heed of the advise now. Governor General Sir Frank Kabui during the Queens Birthday celebration last June expressed concern over the uncontrolled alcohol consumption in the country which led to a number of problems. In his speech he called for a ban in the importation of yeast which is the main ingredient in the production of kwaso. This is to reduce kwaso production. “Common sense tells us that if we want to reduce the production of kwaso, it may be necessary to consider restricting the distribution of yeast in the country. “In my view, this can be done by the stroke of a pen. “The Government can act through the relevant government officials in the relevant Ministries.”.